With her exceptional volley, Yasmin Schnack has fared better in doubles than singles since turning professional two years ago. But the former UCLA All-American's singles career received a boost Wednesday in the first round of her hometown tournament. 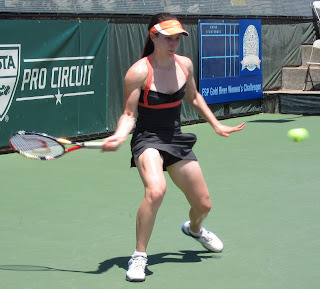 Schnack, a 24-year-old resident of Elk Grove in the Sacramento area, upset third-seeded Marie-Eve Pelletier 6-3, 3-6, 6-3 in the featured night match at the $50,000 FSP Gold River Women's Challenger at the Gold River Racquet Club. It's the first women's pro tournament in the Sacramento area since at least the early 1970s and the first pro event at the club since the Sacramento Capitals of World TeamTennis moved to Sunrise Mall 10 years ago. Schnack admitted she was surprised to beat Pelletier, a 30-year-old Fed Cup veteran for Canada, in their first career singles meeting. They are friends who are scheduled to play doubles together for the first time next week in El Paso, Texas. "I've known her for a while," Schnack said of Pelletier, a right-hander who played with a possible cartilage tear in her right shoulder but didn't seem hindered. "She's a great girl and a great player with a lot of experience. I knew I would have to play my best. I caught her on a bit of an off day, but I'll take what I can get. It's a confidence booster for me to beat someone of that caliber." Schnack wasn't the only Northern Californian who pulled off a first-round upset. Romana Tedjakusuma, a 35-year-old Tracy resident from Indonesia, knocked off sixth-seeded Adriana Perez, a 19-year-old Venezuelan, 7-6 (2), 7-5. Meanwhile, Alexandra Stevenson's tailspin continued as she fell to Lena Litvak of Bronx, N.Y., 3-6, 6-3, 6-3. In 1999, Stevenson joined John McEnroe as the only qualifiers in Wimbledon history to reach the semifinals. Ranked a career-high No. 18 in 2002, Stevenson has plunged to No. 410. The 31-year-old daughter of NBA legend Julius Erving appeared to be packing a few extra pounds on her 6-foot-1 frame against the 5-foot-4 Litvak, who played at Harvard in 2006-07 before turning pro. Schnack won a main-draw singles match for the first time since January. In singles, she's ranked No. 399 in the world with two career ITF (minor-league) titles. In doubles, she's No. 152 with nine crowns. Her 5-foot-10 height gives her power on her serve and groundstrokes but limits her quickness. Like Schnack, the 5-foot-8 Pelletier has had more success in doubles than singles. She is ranked No. 284 in singles with two career ITF titles and No. 136 in doubles with 21 championships. She has been as high as No. 106 in singles (2005) and No. 54 in doubles (2010). Schnack said playing in her hometown helped "big time," although it initially worked against her. "I had so much support," said Schnack, who will return for her second season with the Capitals in July. "I was so nervous in the beginning. To have everyone support me made a big difference." The bad news for Schnack was she lost her first two service games. The good news was Pelletier dropped her first three service games and double-faulted to lose the first set. Schnack then suffered a letdown, getting broken in the opening game of the second set. Both players held serve from there until Schnack was broken at love to lose the set. But Schnack held serve throughout the third set and broke for 4-2 and 6-3. "She started playing better and attacking in the second set, and I hit shorter," Schnack said. "Then I quieted down everything. I used a compact swing and focused on getting balls in the court. The more I made her play, the better chance I had. She let up just enough for me to get my confidence back, and the momentum shifted." Schnack will play another first-time opponent, 17-year-old Samantha Crawford of Tamarac, Fla., today in the third match on the Stadium Court. The first one begins at 11 a.m.
Crawford won last year's USTA girls 18 doubles title with Madison Keys to earn a wild card into women's doubles at the U.S. Open. The teenagers then lost to sixth-seeded Sania Mirza of India and Elena Vesnina of Russia 6-2, 6-0 in the first round. "She's a great up-and-coming American player," Schnack said of Crawford. "I think she's here with Tom Gullikson (the USTA's lead national coach for women's tennis). She's working with one of the best coaches in the world. "She'll come out with good strategy and technique. She's a big hitter. If I mix it up, give her off-pace shots and keep her off-balance, I think I'll have a good chance." See below for Wednesday's full results and today's order of play. French Open in Paris -- Second-seeded Bob and Mike Bryan, the 1998 NCAA doubles champions from Stanford, defeated Sergiy Stakhovsky of Ukraine and Mikhail Youzhny of Russia 7-5, 6-3 in the first round of the French Open. The 34-year-old Bryan twins won the French Open in 2003 and reached the final in 2005 and 2006. Also advancing were 15th-seeded Scott Lipsky, an NCAA doubles runner-up in 2002 from Stanford, and Rajeev Ram of Carmel, Ind. The champions of the 2011 SAP Open in San Jose beat Australians Ashley Fisher and Marinko Matosevic 7-5, 6-2. In the opening round of mixed doubles, seventh-seeded Mirza and countryman Mahesh Bhupathi downed Raquel Kops-Jones and Eric Butorac 6-2, 6-4. Kops-Jones won the 2003 NCAA women's doubles title with Cal teammate Christina Fusano, a Sacramento native who retired from the pro circuit last year. Butorac played for the Capitals in 2008. Television coverage of the French Open continues today live from 2 to 7 a.m. PDT on ESPN2 and 7 a.m to 4 p.m. on Tennis Channel, which also will broadcast its daily wrapup show from 4 to 7 p.m.
Bank of the West Classic -- Three of the world's top 10 players have entered the Bank of the West Classic, July 7-15 at Stanford. Highlighting the field will be No. 5 Serena Williams of Palm Beach Gardens, Fla., No. 8 Marion Bartoli of France and No. 10 Angelique Kerber of Germany. Williams, the defending champion, has won 13 Grand Slam singles titles. Bartoli, the Stanford champion in 2009 and runner-up in 2008 and 2011, reached the Wimbledon final in 2007. Kerber gained the U.S. Open semifinals last year. Entries also include former world No.1 Jelena Jankovic of Serbia, 2011 Wimbledon semifinalist Sabine Lisicki of Germany and two-time Grand Slam singles champion Svetlana Kuznetsova of Russia. In conjunction with the tournament, three American men in the International Tennis Hall of Fame will play a series of exhibition matches. Pete Sampras will face Michael Chang on July 11 and Jim Courier on July 12. Courier will play Chang on July 13. Tickets are available by calling 866-WTA-TIXS (866-982-8497) or visiting www.bankofthewestclassic.com. Williams (5); Bartoli (8); Kerber (10); Lisicki (13); Dominika Cibulkova (16), Slovakia; Jankovic (21); Kuznetsova (28); Nadia Petrova (29), Russia; Peng Shuai (30), China; Monica Niculescu (33), Romania; Yanina Wickmayer (35), Belgium; Christina McHale (36), Englewood Cliffs, N.J.; Simona Halep (37), Romania; Marina Erakovic (42), New Zealand; Sorana Cirstea (43), Romania; Chanelle Scheepers (45), South Africa; Petra Martic (50), Croatia; Tamira Paszek (52), Austria; Vania King (57), Boynton Beach, Fla.; and Varvara Lepchenko (63), Allentown, Pa.
Elena Bovina (1), Russia, def. Elizabeth Profit, United States, 6-1, 6-0. Samantha Crawford, United States, def. Tori Kinard, United States, 5-7, 6-4, 6-3. Maria Sanchez (4), Modesto, def. Mary Closs, Menlo Park, 6-3, 6-1. Lena Litvak, United States, def. Alexandra Stevenson, United States, 3-6, 6-3, 6-3. Asia Muhammed (Capitals), United States, def. 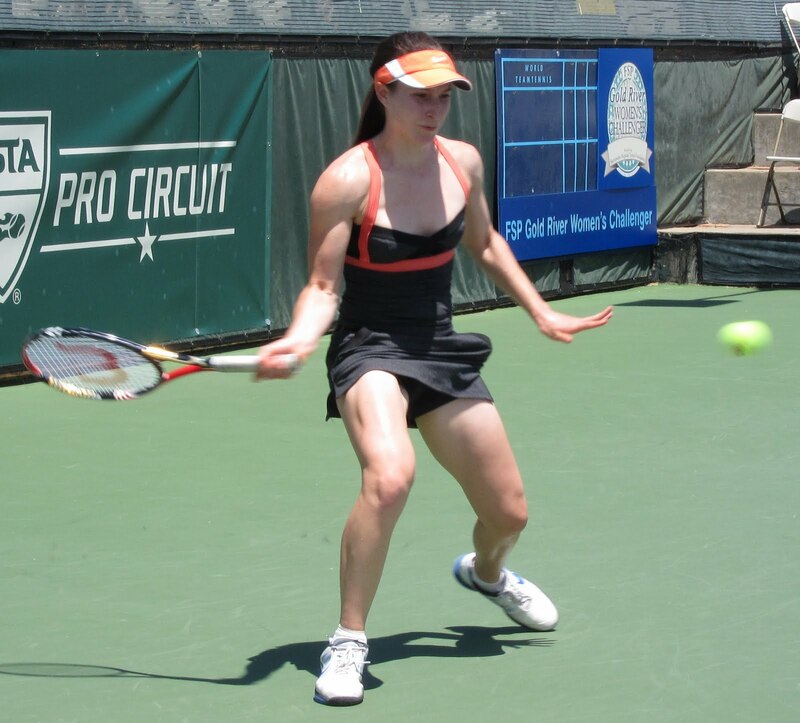 Diana Ospina, United States, 6-4, 7-6 (4). Ashley Weinhold (2), United States, def. Tatsiana Kapshai, Sacramento/Belarus, 6-1, 6-0. Romana Tedjakusuma, Tracy/Indonesia, def. Adriana Perez (6), Venezuela, 7-6 (2), 7-5. Gabrielle Faith Andrews, United States, def. Piia Suomalainen, Finland, 6-3, 4-3, ret. Yasmin Schnack, Elk Grove/Capitals, def. Marie-Eve Pelletier (3), Canada, 6-3, 3-6, 6-3. Elena Bovina, Russia, and Gabriela Paz (4), Venezuela, def. Celine Cattaneo, France, and Nicole Robinson, United States, 6-2, 6-0. Yawna Allen and Eric Clark, United States, def. Isabella Kling, Orangevale/Sweden, and Kelly Wilson, Cameron Park, 7-5, 2-6, 10-7 tiebreak. Jessica Pegula (5), United States, vs. Jennifer Elie, United States. Elena Bovina (1), Russia, vs. Maria-Fernanda Alves, Brazil. Yasmin Schnack, Elk Grove/Capitals, vs. Samantha Crawford, United States. (Not before 6:30 p.m.) Jessica Pegula (5), United States, and Marie-Eve Pelletier (1), Canada, vs. Jennifer Elie, United States, and Kim-Alice Grajdek, Germany. Asia Muhammed (Capitals), United States, vs. Gabriela Paz (8), Venezuela. Whitney Jones, United States, vs. Valeria Solovieva (7), Russia. Ashley Weinhold (2), United States, vs. Lena Litvak, United States. Romana Tedjakusuma, Tracy/Indonesia, vs. Elizabeth Lumpkin, United States. Maria Sanchez (4), Modesto, vs. Gabrielle Faith Andrews, United States. Chieh-Yu Hsu and Ashley Weinhold, United States, vs. Whitney Jones and Elizabeth Lumpkin, United States. (Not before 4:30 p.m., might be moved to Stadium Court) Gabrielle Faith Andrews and Samantha Crawford, United States, vs. Maria-Fernanda Alves, Brazil, and Valeria Solovieva (3), Russia. Breanna Bachini shouldn't even have been on the court. But she couldn't resist the chance to play a $50,000 tournament in her hometown. Playing with a bone spur and plantar fasciitis in her left foot, the 19-year-old wild card from the Sacramento suburb of Roseville fell to veteran Whitney Jones of St. Louis 6-2, 6-3 Tuesday in the first round of the FSP Gold River Women's Challenger at the Gold River Racquet club. Bachini, who finished her freshman year at Syracuse two weeks ago, had never played in the main draw of a professional tournament or in one offering more than $10,000. Bachini lost her serve twice in each set against the 25-year-old Jones and never earned a break point. Unforced errors, combined with Jones' power and quickness, proved fatal. Still, the 5-foot-6 Bachini displayed a surprisingly powerful serve, a punishing forehand and a fiery spirit. Literally from the first point, she exhorted herself with cries of "C'mon" after points she won and thigh slaps after those she lost. Afterward, Bachini was hardly discouraged. "I played really well considering I didn't have a lot of time to prepare," she said. "I didn't hit for a month before I came home two weeks ago. ... I've been trying to get as physically fit as possible and playing through pain, but this was a huge opportunity. "I'm disappointed I didn't get the result I wanted, but I'm proud of myself that I did everything I could after all the struggles I've been through the past year." Bachini chose Syracuse because she thought coach Luke Jensen, known in his playing days as "Dual Hand Luke" because of his ambidextrous feats, could help her reach the pros with his impressive playing background and his gung-ho attitude. In 1993, Jensen won the French Open men's doubles title with his brother, Murphy, and attained a career-high doubles ranking of No. 6 in the world. Injuries, though, derailed Bachini's freshman season. She pulled a stomach muscle. Overuse, she said, created the spur. And a problem with her orthotics (shoe inserts), which she has worn since she was 14, might have caused the plantar fasciitis (inflammation of the tissue on the bottom of the foot). "I have to wear orthotics the rest of my life," Bachini explained. "I have no arches. At Syracuse, they gave me new orthotics and mistakenly made them half an inch higher on my left foot. The doctor here thinks that caused the plantar fasciitis. "It also put stress on the pelvic area that I had strained. As you can imagine, coming home and finding out, I wasn't too thrilled. Orthotics are supposed to prevent plantar fasciitis, not cause it." Bachini finished her freshman season 4-5 in singles (3-1 at No. 4) and 1-5 in doubles (1-3 at No. 1). But she won four straight singles matches in victories over Cincinnati, No. 55 Boston College, No. 60 Harvard and Temple to help Syracuse crack the Intercollegiate Tennis Association rankings for the first time in school history at No. 73. "Beating Boston College and Harvard helped us get on the map," Bachini said. "It was great to be a part of that." The Orange later beat No. 25 Yale, although Bachini lost at No. 3 singles, for the biggest win in program history to reach a school-record No. 39. Bachini said she will play no more tournaments this summer in an effort to get healthy for her sophomore season. She does not plan to have surgery. "When I go back to Syracuse, I'm going to be pounding it hard," Bachini said. "I don't want to have another year like last one that was all about injuries." --Former Sacramento State star Tatsiana Kapshai advanced to the main draw with a 6-3, 6-2 victory in qualifying over seventh-seeded Simone Kalhorn, an ex-Syracuse standout from Colorado Springs, Colo.
Kapshai, a Belarus native who has won the last three Big Sky Conference MVP awards, plays second-seeded Ashley Weinhold of Spicewood, Texas, today in the third match on Court 7. The first one begins at 11 a.m.
--Second-seeded Asia Muhammed of Las Vegas and Yasmin Schnack of Elk Grove in the Sacramento area topped Americans Nadia Echevarria Alam and Elizabeth Ferris 6-4, 6-4 in the first round of doubles. Rooting for Muhammed and Schnack at courtside was Wayne Bryan, the coach of the Sacramento Capitals in World TeamTennis. In July, Schnack will return for her second season with the Capitals, and Muhammed will make her WTT debut with the team. See below for Tuesday's full results from the Gold River Challenger and Wednesday's schedule. French Open in Paris -- You just never know with free-spirited Dmitry Tursunov. For one thing, clay is the hard-hitting Russian's worst surface. The longtime Sacramento-area resident lost in the first round of singles at the French Open from 2009 through 2011. Yet between 2007 and 2009, he reached the doubles quarterfinals, semifinals and quarterfinals with countryman Igor Kunitsyn. Tursunov, a Moscow native, came into this year's tournament with an eight-match overall losing streak in singles dating to last October. A right-hander with a two-handed backhand, he had strained a tendon in his left wrist last September. He tried to play through the injury until finally sitting out for three months earlier this year. So what does the 88th-ranked Tursunov do Tuesday in the first round of the French Open? He dismisses Go Soeda of Japan 6-1, 6-4, 6-4. Granted, the 5-foot-10, 148-pound Soeda wasn't going to blow Tursunov off the court. But Soeda, who won the 2009 Tiburon Challenger, is ranked a career-high No. 58. Tursunov has a tough assignment in the second round against a seeded Frenchman. No. 29 Julien Benneteau, who reached the semifinals in his San Jose debut in February, advanced with a 6-2, 6-7 (3), 6-4, 6-4 victory over Germany's Mischa Zverev, ironically another Moscow native. Tursunov and Benneteau have split their two meetings (both on hardcourt). That figures, as they are remarkably similar. Benneteau is 30, Tursunov 29. Both were born in December and turned pro in 2000. Both are 6-foot-1 (Tursunov weighs six pounds more at 180). Like Tursunov, Benneteau is right-handed. Benneteau has earned $4,514,057 in his career, Tursunov $4,132,713. Tursunov reached a career-high No. 20 in the world in 2006. Benneteau hit a peak of No. 26 last month. The big difference between the players is that Tursunov has won seven career singles titles and Benneteau none. Meanwhile, Sam Querrey's troubles in the French Open continued. The 24-year-old San Francisco native fell to 1-6 lifetime at Roland Garros with a 2-6, 6-4, 7-6 (3), 6-3 loss to eighth-seeded Janko Tipsarevic of Serbia in the first round. Querrey is scheduled to play five matches for the Capitals this season. In the opening round of women's doubles, 10th-seeded Raquel Kops-Jones, an ex-Cal All-American from Fresno, and Abigail Spears of San Diego dispatched Andreja Klepac of Slovenia and Alicja Rosolska of Poland 6-3, 6-4. Tatsiana Kapshai (ex-Sacramento State star), Belarus, def. Simone Kalhorn (7), United States, 6-3, 6-2. Tori Kinard (2), United States,def. Sierra Ellison, United States, 6-1, 6-0. Mary Closs, Menlo Park, def. Cindy Nguyen, United States, 6-1, 7-5. Elizabeth Profit, United States,def. Wendy Qi-Wen Zhang, Canada, 6-1, 6-4. Jessica Pegula (5), United States, def. Elizabeth Ferris, United States, 6-4, 6-0. Gabriela Paz (8), Venezuela, def. Anne-Liz Jeukeng, United States, 6-3, 6-3. Elizabeth Lumpkin, United States, def. Kim-Alice Grajdek, Germany, 6-2, 6-1. Jennifer Elie, United States, def. Chieh-Yu Hsu, United States, 6-0, 6-4. Whitney Jones, United States, def. Breanna Bachini, Roseville, 6-2, 6-3. Maria-Fernanda Alves, Brazil, def. Sachie Ishizu, Japan, 6-0, 6-1. Valeria Solovieva (7), Russia, def. Celine Cattaneo, France, 6-3, 6-0. Kaitlyn Christian, United States, and Maria Sanchez, Modesto, def. Svetlana Krivencheva, Bulgaria, and Diana Ospina, United States,6-1, 5-7, 10-7 tiebreak. Asia Muhammed, United States, and Yasmin Schnack (2), Elk Grove, def. Nadia Echeverria Alam, United States,and Elizabeth Ferris, United States, 6-4, 6-4. Lena Litvak, United States, and Adriana Perez, Venezuela, def. Simone Kalhorn and Lauren Megale, United States, 7-5, 6-2. Elena Bovina (1), Russia, vs. Elizabeth Profit, United States. Maria Sanchez (4), Modesto, vs. Mary Closs, Menlo Park. Asia Muhammed, United States, vs. Diana Ospina, United States. Elena Bovina, Russia, and Gabriela Paz (4), Venezuela, vs. Celine Cattaneo, France, and Nicole Robinson, United States. (Not before 6:30 p.m.) Yasmin Schnack, Elk Grove, vs. Marie-Eve Pelletier (3), Canada. Isabella Kling, Orangevale, and Kelly Wilson, Cameron Park, vs. Yawna Allen and Erin Clark, United States. Tori Kinard, United States, vs. Samantha Crawford, United States. Lena Litvak, United States, vs. Alexandra Stevenson, United States. Tatsiana Kapshai (ex-Sacramento State star), Belarus, vs. Ashley Weinhold (2), United States. Romana Tedjakusuma, Tracy/Indonesia, vs. Adriana Perez (6), Venezuela. Piia Suomalainen, Finland, Gabrielle Andrews, United States. For the first time in 27 years, a Stanford woman swept the NCAA women's singles and doubles titles Monday. Nicole Gibbs, seeded third, outlasted doubles partner Mallory Burdette, seeded fifth, 2-6, 7-6 (5), 6-3 in Athens, Ga., after trailing 4-1 and 5-2 in the second set. Then, in a match moved indoors because of rain, Burdette and Gibbs defeated Nadja Gilchrist and Chelsey Gullickson of host Georgia 6-2, 6-4. Gullickson, the daughter of former major league pitcher Bill Gullickson and younger sister of touring pro Carly Gullickson, won the 2010 NCAA singles title in Athens. Gibbs became the third Cardinal woman to capture both championships in one season. Kathy Jordan won AIAW titles in 1979, and Linda Gates took NCAA crowns in 1985. The last woman at any school to do it was Keri Phebus of UCLA in 1995. This was the first time in NCAA men's or women's tennis history that teammates met in the singles final before pairing up in the doubles title match. "Today's probably one of the biggest days in our program's history," Stanford coach Lele Forood told reporters. "It's very exciting, especially because no one's graduating. So, we go forward from here. "It's quite an amazing day. It's hard to play your teammate in such a big moment and then to come back and double with them to a title. That's a testament to how mature they both are and that they could do what they had to do today." On the men's side, Steve Johnson of USC became the only player to win back-to-back team and singles titles in the same years under the current NCAA Championships format. Johnson, seeded first, beat Kentucky's Eric Quigley, seeded third, 6-4, 6-4 to end his collegiate career with four team titles, two singles crowns and a 72-match winning streak in singles. Gibbs, a sophomore from Santa Monica in the Los Angeles area, became the first Stanford woman to win the NCAA singles title since Amber Liu in 2004. Liu, who married International Tennis Hall of Famer Michael Chang in 2008, also took the crown in 2003. A Stanford team won the doubles title for the third consecutive year. Hilary Barte and Lindsay Burdette, Mallory's sister, took first place in 2010, and Barte and Mallory Burdette did the honors last year. Yet another Burdette from Stanford, Erin, won the 2005 NCAA doubles event with Alice Barnes. The difference in Monday's singles final was mental toughness. The 5-foot-10 Burdette, a junior playing near her home in Jackson, Ga., had not lost more than three games in a set in her five previous singles matches during the tournament. She was in control in the final, too, before Gibbs stormed back. "It's always a very tough situation to be playing your teammate," said the 5-foot-6 Gibbs, who extended her winning streak to 17 matches, "and then I got down 6-2, 4-1 to a girl that has been playing incredible tennis, but I just didn't let myself give up from that point. I had worked too hard and come too far in this tournament to just lay down, but at the same time, I got very lucky to turn that match around. I still consider myself very lucky for that win." Burdette admitted Gibbs was stronger mentally. "I was feeling it a little out there, but I think Nicole is very good at stepping it up when her opponent is about to close things out," Burdette said. "That's her specialty, and she definitely made it tough for me out there in the end. I didn't have the guts to finish it today." It was the second consecutive year that Burdette blew a big lead in an NCAA final. She led Lauren Embree of Florida 4-0 in the third set of the deciding match in the team event at Stanford but lost to end the Cardinal's 12-year, 184-match home winning steak. Fish has heart procedure -- American Mardy Fish recently had a medical procedure to correct an irregular heartbeat, the Associated Press reported. Fish, who has played only one match since late March because of what he called "fatigue," is recovering at his home in Los Angeles. The top-ranked U.S. man at No. 10 in the world, he hopes to return the week of June 11 for a grass-court tournament in London before Wimbledon. Fish is scheduled to play home matches for the Sacramento Capitals of World TeamTennis on July 12 and 13. Gold River Challenger -- In a matchup of local wild cards, Tatsiana Kapshai overpowered Kelly Wilson 6-3, 6-4 in the second round of qualifying for the $50,000 FSP Gold River Women's Challenger at the Gold River Racquet Club in the Sacramento area. Kapshai, a 23-year-old native of Minsk, Belarus, is playing in her first professional tournament after completing her eligibility at Sacramento State this month. She recently won her third consecutive Big Sky Conference MVP award. Wilson, a 38-year-old teaching pro at Gold River, reached No. 1 nationally at the University of Texas and No. 192 in the world as a pro in the 1990s. See below for Monday's full results and today's order of play. Steve Johnson (1), USC, def. Eric Quigley (3), Kentucky, 6-4, 6-4. Chase Buchanan and Blaz Rola (1), Ohio State, def. Raony Carvalho and Gonzalo Escobar, Texas Tech, 7-6 (4), 6-3. Nicole Gibbs (3), Stanford, def. Mallory Burdette (5), Stanford, 2-6, 7-6 (5), 6-3. Mallory Burdette and Nicole Gibbs (2), Stanford, def. Nadja Gilchrist and Chelsey Gullickson, Georgia, 6-2, 6-4. Tatsiana Kapshai, Belarus, def. Kelly Wilson, Cameron Park, 6-3, 6-4. Simone Kalhorn (7), United States, def. Lauren Megale, United States, 6-3, 7-5. Tori Kinard (2), United States, def. Jessica Wacnik, United States, 6-2, 4-6, 6-3. Sierra Ellison, United States, def. Svetlana Krivencheva, Bulgaria, 6-2, 6-4. Cindy Nguyen, United States, def. Nicole Robinson (3), United States, 6-3, 2-6, 6-2. Mary Closs, Menlo Park, def. Alessondra Parra, United States, 6-2, 6-3. Wendy Zhang, Canada, def. Brittany Lashway, United States, 6-2, 6-1. Elizabeth Profit, United States, def. Kyra Wojcik (6), United States, 6-2, 6-2. Tatsiana Kapshai, Belarus, vs. Simone Kalhorn, United States. Jessica Pugula (5), United States, vs. Elizabeth Ferris, United States. Breanna Bachini, Roseville, vs. Whitney Jones, United States. Kaitlyn Christian, United States, and Maria Sanchez, Modesto, vs. Svetlana Krivencheva, Bulgaria, and Diana Ospina, Bloomfield Hills, Mich.
Cindy Nguyen, United States, vs. Mary Closs, Menlo Park. Gabriela Paz (8), Venezuela, vs. Anne-Liz Jeukeng, United States. Sachie Ishizu, Japan, vs. Maria-Fernanda Alves, Brazil. Tori Kinard, United States, vs. Sierra Ellison, United States. Elizabeth Lumpkin, United States, vs. Kim-Alice Grajdek, Germany. Nadia Echeverria Alam, United States, and Elizabeth Ferris, United States, vs. Asia Muhammed, Las Vegas, and Yasmin Schnack (2), Elk Grove. Wendy Zhang, Canada, vs. Elizabeth Profit, United States. Jennifer Elie, United States, vs. Chieh-Yu Hsu, United States. Celine Cattaneo, France, vs. Valeria Solovieva (7), Russia. Simone Kalhorn, United States, and Lauren Megale, United States, vs. Lena Litvak, United States, and Adriana Perez, Venezuela. Today-Friday -- French Open, early rounds, ESPN2, 2-7 a.m. (live); Tennis Channel, 7 a.m.-4 p.m. (live), 4-7 p.m. (French Open Tonight). For the first time in eight years, a Stanford player will win the NCAA women's singles title. Cardinal doubles partners Nicole Gibbs and Mallory Burdette will meet today at 9 a.m. PDT in Athens, Ga., for the crown. Video streaming is available at www.georgiadogs.com. It will be the first all-Stanford women's final since 2001, when Laura Granville beat Lauren Kalvaria 6-3, 7-6 (1) in Stone Mountain, Ga. The last Cardinal woman to win the title was Amber Liu, who captured her second straight in 2004. Liu married Michael Chang, an International Tennis Hall of Famer, in 2008. They have a daughter who will be 2 in December. Gibbs, seeded third, toppled No. 1 seed Allie Will of Florida 6-2, 4-6, 6-3 Sunday, and Burdette, seeded fifth, cruised past No. 9-16 seed Zsofi Susanyi of Cal 6-2, 6-2. In the men's semifinals, top-seeded Steve Johnson of USC defeated unseeded Bradley Klahn of Stanford 6-4, 7-5 in a matchup of the last two NCAA champions. Johnson, who extended his winning streak to 71 matches, will try to win his second straight title when he faces third-seeded Eric Quigley of Kentucky today at 9 a.m. Quigley edged No. 9-16 seed Blaz Rola of Ohio State 2-6, 6-1, 7-6 (1). Burdette, a 5-foot-10 junior from nearby Jackson, Ga., has not lost more than three games in a set in her five victories. She has knocked off three Pacific-12 Conference rivals, plus second-seeded Beatrice Capra of Duke. Capra reached the third round of the 2010 U.S. Open as an 18-year-old wild card. Gibbs, a 5-foot-6 sophomore from the Los Angeles suburb of Santa Monica, nipped Burdette 6-4, 3-6, 7-6 (3) in the final of the ITA Northwest Regional Championships at Stanford last October. It was their only meeting this season. Burdette and Gibbs also reached today's NCAA doubles final. Seeded second, they beat Natalie Pluskota and Kata Szekely of Tennessee 7-6 (1), 6-1 to set up a meeting with Nadja Gilchrist and Chelsey Gullickson of host Georgia. See below for full singles and doubles results of Stanford and Cal players in the NCAA Championships. Stanford's Thacher honored -- Stanford's Ryan Thacher received the Intercollegiate Tennis Association's Arthur Ashe Jr. Award for Leadership and Sportsmanship. Thacher and Klahn, senior co-captains, reached the NCAA doubles semifinals in 2010, final in 2011 and quarterfinals this year. Thacher, a history major with a 3.91 grade-point average, plans to become a pediatric surgeon or trauma specialist after playing professional tennis. Gold River Challenger -- Wild card Kelly (Pace) Wilson, a 38-year-old teaching professional playing at her home club, stunned top-seeded Nadia Echeverria Alam, a 17-year-old pro player from Miami, 6-0, 2-6, 6-1 in the first round of qualifying for the $50,000 FSP Gold River Women's Challenger. The tournament is being held at the Gold River Racquet Club in the Sacramento area through Sunday. The Venezuela-born Echeverria Alam, ranked No. 867 in the world, struggled with nerves in the first and third sets. Wilson, 5-foot-8 and slightly built, also frustrated her with slices and changes of speed. "I started laughing to myself, saying, 'She must be thinking, I've only seen people play like this on Tennis Channel Classic,' " said Wilson, who reached No. 1 nationally at the University of Texas and No. 192 in the world 1990s. "Without a doubt, I was not going to play a style she was comfortable with. There's no doubt she can hit with a lot more power. Knowing a lot of these players play with one speed, I was going to make sure each speed was different than the previous ball." Wilson will play Tatsiana Kapshai of Belarus today after a 1 p.m. match on the Stadium Court. Kapshai, making her pro debut after winning three straight Big Sky Conference MVP awards at Sacramento State, beat 17-year-old wild card Tori Trylovich of nearby El Dorado Hills 6-4, 6-1. Wild card Jessica-Mariama Josiah of Sacramento lost to Jessica Wacnik, a sophomore-to-be at Boston College from Orlando Park, Ill., 6-3, 6-4. Steve Johnson (1), USC, def. Bradley Klahn, Stanford, 6-4, 7-5. Eric Quigley (3), Kentucky, def. Blaz Rola (9-16), Ohio State, 2-6, 6-1, 7-6 (1). Chase Buchanan and Blaz Rola (1), Ohio State, def. Costin Paval and Dane Webb, Oklahoma, 4-6, 6-3, 6-4. Raony Carvalho and Gonzalo Escobar, Texas Tech, def. Chris Thiemann and Marcel Thiemann, Mississippi, 6-4, 6-2. Nicole Gibbs (3), Stanford, def. Allie Will (1), Florida, 6-2, 4-6, 6-3. Mallory Burdette (5), Stanford, def. Zsofi Susanyi (9-16), Cal, 6-2, 6-2. Nadja Gilchrist and Chelsey Gullickson, Georgia, def. Courtney Dolehide and Pamela Montez, UCLA, 7-6 (5), 6-4. Mallory Burdette and Nicole Gibbs (2), Stanford, def. Natalie Pluskota and Kata Szekely, Tennessee, 7-6 (1), 6-1. Mardy Fish, Sacramento Capitals (2012) of World TeamTennis -- No. 10 in singles (no change), No. 730 in doubles (-6). John Paul Fruttero, Cal All-American in 2001 and 2002 -- No. 92 in doubles (no change), unranked in singles. Mark Knowles, Capitals (2001-07, 2009-12), three-time World TeamTennis Male MVP (2001, 2005 and 2007) -- No. 83 in doubles (-1), unranked in singles. Scott Lipsky, 2002 NCAA doubles runner-up from Stanford -- No. 38 in doubles (no change), unranked in singles. Conor Niland, 2006 Pacific-10 Conference Player of the Year and two-time All-American at Cal -- No. 349 in singles (-8), unranked in doubles. Sam Querrey, San Francisco native, Capitals (2012) -- No. 71 in singles (no change), No. 61 in doubles (no change). Dmitry Tursunov, Folsom resident -- No. 88 in singles (-1), No. 209 in doubles (+33). Jimmy Wang, Folsom resident -- No. 193 in singles (-1), No. 383 in doubles (-2). Pedro Zerbini, All-Pacific-10 Conference first team at Cal (2009-11) -- No. 675 in singles (+10), No. 1,414 in doubles (-17). Raquel Kops-Jones, 2003 NCAA doubles champion from Cal -- No. 25 in doubles (-1), No. 727 in singles (-2). Asia Muhammed, Capitals (2012) -- No. 198 in doubles (-2), No. 478 in singles (-9). Maria Sanchez, Modesto resident -- No. 150 in doubles (-4), No. 287 in singles (-4). Yasmin Schnack, Elk Grove resident, Capitals (2011-12) -- No. 152 in doubles (-4), No. 399 in singles (-5). Romana Tedjakusuma, Tracy resident -- No. 736 in singles (-4), unranked in doubles. CoCo Vandeweghe, Capitals (2009, 2012) -- No. 157 in singles (-1), No. 294 in doubles (-3). If Nicole Gibbs wins the NCAA women's singles title, she will have earned it. The Stanford sophomore, seeded third, cleared one major hurdle Saturday in Athens, Ga., when she eliminated sixth seed and defending champion Jana Juricova of Cal 6-2, 7-5 in the quarterfinals. Next for Gibbs is No. 1 seed Allie Will, who has led Florida to two consecutive national championships. The match is scheduled for 9 a.m. PDT today (video streaming at www.georgiadogs.com). And that's just to get to the final. Similarly, unseeded Bradley Klahn of Stanford and top-seeded Steve Johnson of USC will meet today at 10:30 a.m. in the men's semifinals. It will be a matchup of the last two NCAA champions. Johnson, a senior from Orange in the Los Angeles area and the defending champ, has won 70 consecutive matches. Klahn, a senior left-hander from the San Diego suburb of Poway, is the last player to beat him. He accomplished the feat on Jan. 17, 2011). Gibbs, a product of Santa Monica in the Los Angeles area, avenged a 6-7 (5), 7-5, 7-6 (2) loss to Juricova in last year's NCAA semifinals at Stanford and improved to 3-0 this season against her Bay Area rival. This will be the first time in three years that Juricova, a senior from Slovakia, has not appeared in the NCAA singles final. She lost to Georgia's Chelsey Gullickson in the 2010 title match in Athens. Juricova also won the 2009 NCAA doubles title with Mari Andersson but lost in Saturday's doubles quarterfinals with Zsofi Susanyi. Will, a senior from Boca Raton, Fla., beat Gibbs 6-4, 2-6, 6-4 on Feb. 12 at Stanford in their only meeting this season. Susanyi, a freshman from Hungary, will play fifth-seeded Mallory Burdette of Stanford in today's other women's singles semifinal. Burdette, a junior from nearby Jackson, Ga., ousted second-seeded Beatrice Capra of Duke 6-3, 6-2. Capra, a freshman from Ellicott City, Md., reached the third round of the 2010 U.S. Open as an 18-year-old wild card. Burdette is 2-0 this season against Susanyi, who downed Sabrina Santamaria of USC 6-2, 7-6 (4). Burdette prevailed 6-2, 6-4 and 7-6 (4), 6-2. The second-seeded pair of Burdette and Gibbs also advanced to the doubles semifinals. Johnson is 2-0 against Klahn this season, winning 6-3, 6-4 and 6-4, 6-3. Klahn had surgery for a herniated disc during the offseason. The other men's semifinal pits third-seeded Eric Quigley of Kentucky against No. 9-16 seed Blaz Rola of Ohio State. Rola upset second-seeded Mitchell Frank, a Virginia freshman, 7-6 (5), 6-1. Klahn and Ryan Thacher, last year's doubles runners-up, lost in the quarterfinals. Seeded fourth, they fell to Costin Paval and Dane Webb of Oklahoma 5-7, 7-6 (4), 6-3. See below for Saturday's singles and doubles results of Stanford and Cal players in the NCAA Championships. ATP World Tour in Nice, France -- Top-seeded Bob and Mike Bryan, the 1998 NCAA doubles champions from Stanford, defeated unseeded Oliver Marach of Austria and Filip Polasek of Slovakia 7-6 (5), 6-3 to win the Open de Nice Cote d'Azur. It was the Bryans' third title of the year and 78th overall. They also triumphed in Sydney in January and Monte Carlo last month. Women's Challenger in Gold River -- Tatsiana Kapshai, an ex-Sacramento State star, and Kelly Wilson, a former top-200 player in the world who teaches at the host Gold River Racquet Club, highlight today's first round of qualifying in the $50,000 FSP Gold River Women's Challenger. Kapshai, a native of Minsk, Belarus, just completed her eligibility after winning three straight Big Sky Conference MVP awards. She will face Tori Trylovich (Oak Ridge High School in El Dorado Hills, a Sacramento suburb) in the third match on the Stadium Court. Wilson, 38, will take on top-seeded Nadia Echeverria Alam, a 17-year-old American, in the third match on Court 1. Kapshai, Trylovich and Wilson are wild cards. Play begins on all courts at 10 a.m.
Steve Johnson (1), USC, def. Alex Domijan, Virginia, 6-0, 5-7, 6-1. Bradley Klahn, Stanford, def. Nik Scholtz (9-16), Mississippi, 6-1, 6-3. Eric Quigley (3), Kentucky, def. Henrique Cunha (5), Duke, 6-4, 6-3. Blaz Rola (9-16), Ohio State, def. Mitchell Frank (2), Virginia, 7-6 (5), 6-1. Chase Buchanan and Blaz Rola (1), Ohio State, def. Panav Jha and Eric Quigley (5-8), Kentucky, 6-3, 6-4. Costin Paval and Dane Webb, Oklahoma, def. Bradley Klahn and Ryan Thacher (4), Stanford, 5-7, 7-6 (4), 6-3. Chris Thiemann and Marcel Thiemann, Mississippi, def. Antoine Baroz and Alexis Heugas, Virginia Commonwealth, 2-6, 6-3, 7-6 (4). Raony Carvalho and Gonzalo Escobar, Texas Tech, def. Steve Johnson and Roberto Quiroz (2), USC, 6-2, 3-2, ret. Allie Will (1), Florida, def. Cristina Sanchez-Quintanar (7), Texas A&M, 6-3, 6-3. Nicole Gibbs (3), Stanford, def. Jana Juricova (6), Cal, 6-2, 7-5. Zsofi Susanyi (9-16), Cal, def. Sabrina Santamaria, USC, 6-2, 7-6 (4). Mallory Burdette (5), Stanford, def. Beatrice Capra (2), Duke, 6-3, 6-2. Courtney Dolehide and Pamela Montez, UCLA, def. Ema Burgic and Nina Secerbegovic, Baylor, 6-1, 3-6, 6-3. Nadja Gilchrist and Chelsey Gullickson, Georgia, def. Jana Juricova and Zsofi Susanyi, Cal, 6-1, 6-2. Natalie Pluskota and Kata Szekely, Tennessee, def. Lauren Embree and Joanna Mather, Florida, 6-4, 4-6, 7-6 (3). Mallory Burdette and Nicole Gibbs (2), Stanford, def. Lorraine Guillermo and Khunpak Issara, Pepperdine, 6-1, 6-3. 7 a.m.-noon (live); NBC, 9 a.m.-noon (live); Tennis Channel, 4-7 p.m. (French Open Tonight). Monday-Friday -- French Open, early rounds, ESPN2, 2-7 a.m. (live); Tennis Channel, 7 a.m.-4 p.m. (live), 4-7 p.m. (French Open Tonight). Through Monday -- NCAA Division I Singles and Doubles Championships, men and women, Athens, Ga., www.georgiadogs.com. Today-June 3 -- $50,000 FSP Gold River Women's Challenger, Gold River Racquet Club, 2201 Gold Rush Drive, Gold River, www.goldriverchallenger.com. Qualifying today (all day beginning at 10 a.m.) and Monday. Main-draw sessions begin at 10 a.m. Tuesday, noon and 6:30 p.m. Wednesday through Friday, and noon on June 2 (semifinals) and June 3 (finals). TODAY-JUNE 10 -- FRENCH OPEN, www.rolandgarros.com. Saturday-June 10 -- $15,000 Sacramento Men's Futures, Park Terrace Swim & Tennis Club, 5500 Parkfield Court, Sacramento, www.parkterraceprotennis.org. June 9-10, 16-18 -- NorCal 18 Junior Sectional Championships, Sacramento State, www.norcal.usta.com. June 9-17 -- $15,000 Chico Men's Futures, Chico Racquet Club & Resort, 1629 Manzanita Ave. The blockbuster rematch is set. Third-seeded Nicole Gibbs of Stanford will face sixth seed and defending champion Jana Juricova of Cal today in the quarterfinals of the NCAA Division I Women's Singles Championship in Athens, Ga. Video streaming of the 9 a.m. PDT match will be available at www.georgiadogs.com. Gibbs, from Santa Monica, and Juricova, from Slovakia, played a thriller in last year's NCAA semifinals at Stanford. Juricova, then a junior, outlasted Gibbs, a freshman at the time, 6-7 (5), 7-5, 7-6 (2) in 2 hours, 57 minutes. Gibbs advanced Friday with a 7-6 (1), 7-6 (6) victory over unseeded Natalie Pluskota of Tennessee. Juricova eliminated Aeriel Ellis of Texas 7-6 (4), 6-2. On the men's side, unseeded Bradley Klahn of Stanford reached the quarterfinals, but No. 9-16 seed Artem Ilyushin of Mississippi State lost. Ilyushin, a senior, lives in the Sacramento suburb of Granite Bay. Gibbs is 2-0 against Juricova this season, winning 4-6, 6-2, 6-2 in the ITA Northwest Regional Championships at Stanford last October and 7-6 (2), 6-2 in the host Cardinal's 4-3 victory over Cal on April 21. Juricova missed Cal's 5-2 loss to Stanford on March 2 in Berkeley with a reported lower back strain that sidelined her from Feb. 12 until March 16. Also reaching the quarterfinals were Stanford junior Mallory Burdette, seeded fifth, and Cal freshman Zsofi Susanyi, seeded 9-16. Susanyi, from Hungary, knocked off fourth-seeded Robin Anderson, a UCLA freshman, 7-5, 6-4. Burdette, playing near her home in Jackson, Ga., will meet second-seeded Beatrice Capra from Duke, and Susanyi will go against unseeded Sabrina Santamaria of USC. Capra reached the third round of the 2010 U.S. Open as an 18-year-old wild card. In the other women's quarterfinal, top-seeded Allie Will of Florida will take on seventh-seeded Cristina Sanchez-Quintanar of Texas A&M. Klahn, the 2010 NCAA singles champion in Athens who had surgery for a herniated disc last offseason, topped No. 9-16 seed Chase Buchanan of Ohio State 6-4, 5-7, 6-2 to set up a match against No. 9-16 seed Nik Scholtz of Mississippi. The winner will face the survivor of the clash between top seed and defending champion Steve Johnson of USC and unseeded Alex Domijan of Virginia. Ilyushin fell to third-seeded Eric Quigley of Kentucky 7-6 (5), 7-6 (4) in a battle of Southeastern Conference rivals. Quigley will face fifth-seeded Henrique Cunha of Duke. The other men's quarterfinal pits second-seeded Mitchell Frank of Virginia against No. 9-16 seed Blaz Rola of Ohio State. See below for Friday's singles and doubles results of Northern California players in the NCAA Championships. French Open in Paris -- Sam Querrey, a San Francisco native and member of the Sacramento Capitals in World TeamTennis, will play eighth-seeded Janko Tipsarevic of Serbia in the first round of the French Open. Dmitry Tursunov, a longtime Sacramento-area resident originally from Moscow, drew Japan's Go Soeda, who won the 2009 Tiburon Challenger. It will be Tursunov's third tournament since he missed three months with a strained tendon in his left wrist. He is right-handed but has a two-handed backhand. The French Open, the second Grand Slam tournament of the year, begins Sunday. Open de Nice Cote d'Azur in Nice, France -- Top-seeded Bob and Mike Bryan, the 1998 NCAA doubles champions, defeated third-seeded Aisam-Ul-Haq Qureshi of Pakistan and Jean-Julien Rojer of the Netherlands Antilles 6-4, 6-4 in the semifinals. Rojer, who was drafted by the Capitals in March but withdrew from the July season, won the Nice title last year with former Capital Eric Butorac. The 34-year-odl Bryan twins, who grew up in Camarillo in the Los Angeles area, seek their 78th title today against unseeded Oliver Marach of Austria and Filip Polasek of Slovakia. World Team Cup in Dusseldorf, Germany -- Tursunov and Igor Kunitsyn edged Ivan Dodig and Lovro Zovko 2-6, 6-3, 10-3 tiebreak in Russia's 2-1 victory over Croatia. Russia finished 1-2 in round-robin play. The Czech Republic and Serbia will meet in today's final. ITF Women's Circuit in Sumter, S.C. -- Romana Tedjakusuma of Tracy was eliminated in singles and doubles at the $10,000 Palmetto Pro Open. Tedjakusuma, a 35-year-old Indonesian, lost to sixth-seeded Di Zhao of China 3-6, 6-1, 7-6 (3) in the quarterfinals and paired with Diana Ospina of Bloomfield Hills, Mich., in a 7-6 (2), 6-3 semifinal loss to Jan Abaza of the United States and Nicola Slater of Great Britain. Bradley Klahn, Stanford, def. Chase Buchanan (9-16), Ohio State, 6-4, 5-7, 6-2. Eric Quigley (3), Kentucky, def. Artem Ilyushin (9-16, Granite Bay), Mississippi State, 7-6 (5), 7-6 (4). Bradley Klahn and Ryan Thacher (4), Stanford, def. Henrique Cunha and Chris Mengel, Duke, 6-7 (3), 6-4, 6-2. Raony Carvalho and Gonzalo Escobar, Texas Tech, def. Nick Andrews (Folsom) and Christoffer Konigsfeldt (5-8), Cal, 6-3, 6-1. Nicole Gibbs (3), Stanford, def. Natalie Pluskota, Tennessee, 7-6 (1), 7-6 (6). Mallory Burdette (5), Stanford, def. Zoe Scandalis (9-16), USC, 6-0, 6-3. Jana Juricova (6), Cal, def. Aeriel Ellis, Texas, 7-6 (4), 6-2. Zsofi Susanyi (9-16), Cal, def. Robin Anderson (4), UCLA, 7-5, 6-4. Mallory Burdette and Nicole Gibbs (2), Stanford, def. Natalie Beazant and Dominique Harmath, Rice, 6-2, 6-2. Jana Juricova and Zsofi Susanyi, Cal, def. Lauren Mira and Jackie Wu, Vanderbilt, 6-0, 7-5. Lauren Embree and Joanna Mather, Florida, def. Annie Goransson and Anett Schutting (5-8), Cal, 3-6, 6-3, 6-3. Today – Brussels (women), final, Tennis Channel, 6:30-8:30 a.m. (live), 4:30-6:30 p.m. (repeat). Dusseldorf (men), final, Tennis Channel, 8:30 a.m.-2:30 p.m. (delay). Nice (men), final, Tennis Channel, 2:30-4:30 p.m. (delay). Monday-June 1 -- French Open, early rounds, ESPN2, 2-7 a.m. (live); Tennis Channel, 7 a.m.-4 p.m. (live), 4-7 p.m. (French Open Tonight). Sunday-June 3 -- $50,000 FSP Gold River Women's Challenger, Gold River Racquet Club, 2201 Gold Rush Drive, Gold River, www.goldriverchallenger.com. Qualifying Sunday and Monday. Main-draw sessions begin at 10 a.m. Tuesday, noon and 6:30 p.m. Wednesday through Friday, and noon on June 2 (semifinals) and June 3 (finals). SUNDAY-JUNE 10 -- FRENCH OPEN, www.rolandgarros.com. June 2-10 -- $15,000 Sacramento Men's Futures, Park Terrace Swim & Tennis Club, 5500 Parkfield Court, Sacramento, www.parkterraceprotennis.org. Three players from Stanford and two from Cal reached the round of 16 in the NCAA Division I Men’s and Women’s Singles Championships in Athens, Ga. The only man from either school advancing Thursday was Cardinal senior Bradley Klahn, who won the 2010 NCAA singles title on the same courts. Joining Klahn in the round of 16 was No. 9-16 seed Artem Ilyushin of Mississippi State and the Sacramento suburb of Granite Bay. Moving ahead on the women’s side were No. 3 Nicole Gibbs and No. 5 Mallory Burdette of Stanford, and No. 6 Jana Juricova, the defending champion, and No. 9-16 Zsofi Susanyi of Cal. Seven of the last 16 women come from the Pacific-12 Conference. Also alive are No. 4 Robin Anderson of UCLA, No. 9-16 Zoe Scandalis of USC and unseeded Sabrina Santamaria of USC. Anderson plays Susanyi today, and Burdette faces Scandalis. Only two of the remaining men are from the Pac-12. Klahn and USC’s Steve Johnson, the top seed and defending champion, could meet in the semifinals. In the first round of women’s doubles, top-seeded Sofie Oyen and Allie Will of Florida lost to Ema Burgic and Nina Secerbegovic of Baylor 7-5, 6-2. See below for Thursday’s singles and doubles results of Northern California players in the NCAAs. ATP World Tour in Nice, France -- Oliver Marach of Austria and Filip Polasek of Slovakia routed wild cards John Isner and Sam Querrey, a San Francisco native and member of the Sacramento Capitals in World TeamTennis, 6-3, 6-0 in the doubles quarterfinals of the Open de Nice Cote d’Azur. French Open in Paris – CoCo Vandeweghe of the Capitals lost in the second round of qualifying to Yaroslava Shvedova of Kazakhstan 6-1, 6-2. 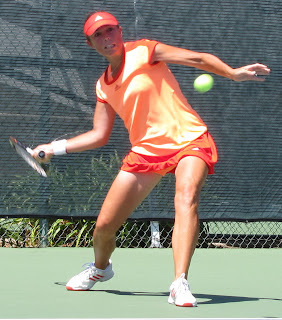 ITF Women’s Circuit in Sumter, S.C. – Romana Tedjakusuma, an Indonesian living in Tracy, defeated Jan Abaza of the United States 6-3, 6-2 in the second round of the $10,000 Palmetto Pro Open. In the doubles quarterfinals, qualifiers Diana Ospina of Bloomfield Hills, Mich., and Tedjakusuma nipped Jelena Durisic of Slovenia and Sanaz Marand of the United States 6-4, 6-7 (2), 10-8 tiebreak. Bradley Klahn, Stanford, def. Remi Boutillier, Fresno State, 6-1, 6-1. Artem Ilyushin (9-16), Mississippi State, def. Jonas Lutjen, Mississippi, 6-0, 6-3. Bradley Klahn and Ryan Thacher (4), Stanford, def. Niall Fitzgerald and Casey Watt, Notre Dame, 6-4, 7-6 (2). Nick Andrews (Folsom) and Christoffer Konigsfeldt (5-8), Cal, def. Phillip Anderson and Jadon Phillips, New Mexico, 6-3, 2-6, 6-4. Roy Kalmanovich and Dennis Nevolo, Illinois, def. George Coupland and Artem Ilyushin, Mississippi State, 6-3, 0-6, 6-2. Nicole Gibbs (3), Stanford, def. Joanna Mather, Florida, 3-6, 6-4, 6-3. No. 5 Mallory Burdette, Stanford, def. Denise Dy (San Jose), Washington, 6-1, 6-2. No. 6 Jana Juricova, Cal, def. Sona Novakova, Baylor, 6-4, 6-1. Zsofi Susanyi (9-16), Cal, def. Mary Anne Macfarlane, Alabama, 6-0, 7-5. Mallory Burdette and Nicole Gibbs (2), Stanford, def. Hilary Bartlett and Lindsay Graff, Princeton, 6-1, 6-1. Annie Goransson and Anett Schutting (5-8), Cal, def. Mary Clayton and Ester Goldfeld, Duke, 6-3, 4-6, 7-6 (7). Jana Juricova and Zsofi Susanyi, Cal, def. Kristi Boxx and Abby Guthrie (5-8), Mississippi, 7-6 (3), 6-4. Kristy Frilling and Shannon Mathews (5-8), Notre Dame, def. Stacey Tan and Ellen Tsay, Stanford, 4-6, 7-5, 7-6 (5). Today – Brussels (women), semifinals, Tennis Channel, 5-9 a.m. (live), 9-11 a.m. (repeat), 3-7 p.m. (repeat). Nice (men), semifinals, Tennis Channel, 11 a.m.-3 p.m. (delay), 7-11 p.m. (repeat). Saturday – Brussels (women), final, Tennis Channel, 6:30-8:30 a.m. (live), 4:30-6:30 p.m. (repeat). Dusseldorf (men), final, Tennis Channel, 8:30 a.m.-2:30 p.m. (delay). Nice (men), final, Tennis Channel, 2:30-4:30 p.m. (delay). Sunday-June 3 -- $50,000 FSP Gold River Women's Challenger, Gold River Racquet Club, 2201 Gold Rush Drive, Gold River, www.goldriverchallenger.com. Elena Bovina, who reached No. 14 in the world in 2005, and promising Tennys Sandgren head the updated entry lists for their respective professional tournaments during the next two weeks in the Sacramento area. Qualifying is set for Sunday and Monday in the FSP Women's USTA $50,000 Challenger at the Gold River Racquet Club in Gold River. Main-draw matches are scheduled for Tuesday through June 3. The men's $15,000 Tennis Town Pro Tennis at Park Terrace begins with qualifying on June 2 and ends June 10. The tournament will be held at the Park Terrace Swim & Tennis Club in south Sacramento. The top three early entrants in the FSP Challenger -- No. 139 Julia Cohen, No. 152 Tetiana Luzhanska and No. 156 CoCo Vandeweghe -- withdrew along with other players. Cohen and Vandeweghe, a member of the Sacramento Capitals in World TeamTennis, remain alive in qualifying for the French Open, which begins Sunday. Bovina, whose career was derailed by shoulder and foot injuries, is the highest-ranked remaining player at No. 243. Other entrants include Capitals Yasmin Schnack, a Sacramento-area resident, and Asia Muhammed; Maria Sanchez of Modesto; and Alexandra Stevenson, a Wimbledon semifinalist in 1999 and the daughter of basketball legend Julius Erving. Meanwhile, 264th-ranked Matt Reid of Australia pulled out of the Park Terrace tournament. That tentatively makes the 20-year-old Sandgren, ranked No. 317, the top seed. Also set to play are Chris Guccione, a 6-foot-7 left-hander from Australia who reached No. 67 in the world in 2008; Devin Britton, the 2009 NCAA champion as a Mississippi freshman; and Bjorn Fratangelo, who last year joined John McEnroe as the only Americans to win the French Open boys singles title in the Open Era. Bovina, a 29-year-old Russian, is by far the most accomplished player in the FSP Challenger. In fact, the 6-foot-2 right-hander has a Grand Slam title to her credit. In 2004, Bovina and Nenad Zimonjic of Serbia defeated Martina Navratilova and Leander Paes for the Australian Open mixed doubles title. Bovina also reached the mixed doubles final of the 2002 French Open with Mark Knowles, a longtime doubles star for the Capitals. In singles, Bovina reached the quarterfinals of the 2002 U.S. Open and the fourth round of the 2003 Australian Open and 2005 French Open. 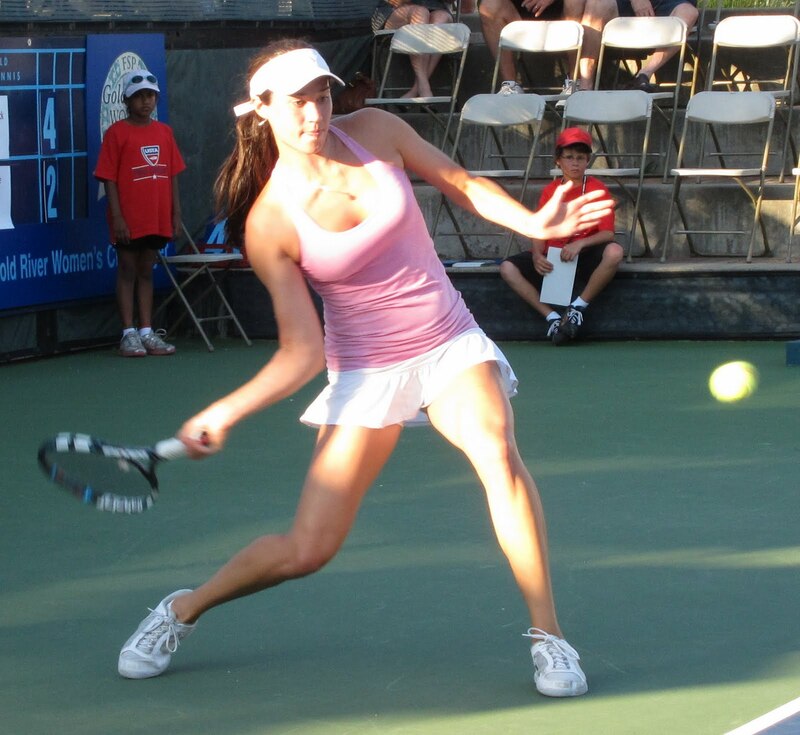 Bovina has won three singles and five doubles titles on the WTA tour, the major leagues of women's tennis, and she played on Russia's victorious Fed Cup team in 2005. Sandgren has won four singles crowns on the Futures circuit, equivalent to the low minor leagues in baseball, since reaching the NCAA singles semifinals last year at Stanford as a Tennessee sophomore and turning pro. He was not named after tennis. FSP Challenger tickets, which begin at $5, can be purchased at www.goldriverchallenger.com or at the tournament. Admission to the Park Terrace tourney is free. NCAA Championships in Athens, Ga. -- Stanford junior Stacey Tan, last year's runner-up from Lakewood in the Los Angeles area, lost to Rice's Natalie Beazant, a freshman from England, 7-5, 6-2 in a first-round matchup of unseeded players in women's singles. Sixth seed and defending champion Jana Juricova of Cal outclassed Kate Turvy of Northwestern 6-3, 6-1. Also advancing with easy victories were Stanford's Nicole Gibbs, seeded third, and Mallory Burdette, seeded fifth. Burdette will meet Washington's Denise Dy, a senior from San Jose who beat Marianne Jodoin of Fresno State 6-4, 7-6 (3). Cal freshman Zsofi Susanyi, seeded 9-16, downed Nebraska's Mary Weatherholt 6-4, 7-5, but two other Bears lost. Tayler Davis, a junior from San Jose, fell to Joelle Kissell of North Carolina State 7-5, 6-1, and Anett Schutting succumbed to Lindsey Hardenbergh of Virginia 6-1, 6-4. Katie Le of the University of Santa Clara fell to Abigail Tere-Apisah of Georgia State 7-6 (4), 5-7, 6-0. On the men's side, Stanford senior Bradley Klahn returned to the site of his 2010 NCAA singles crown and knocked off fourth-seeded Jarmere Jenkins of Virginia 7-5, 6-3 in the opening round. Klahn, a 6-foot left-hander from the San Diego suburb of Poway, is unseeded at No. 36 in the national rankings after undergoing surgery for a herniated disc in the offseason. Stanford senior Ryan Thacher fell to Gonzalo Escobar of Texas Tech 6-3, 7-6 (5). Both Cal men lost to Mississippi State players, one from the Sacramento area. No. 9-16 seed Artem Ilyushin, a senior from Granite Bay, routed Ben McLachlan 6-1, 6-3, and George Coupland rallied past senior Nick Andrews of Folsom in the Sacramento area 4-6, 7-6 (7), 6-4. On Tuesday, USC won its fourth consecutive NCAA men's title and Florida its second straight women's crown. The top-ranked Trojans (33-1) scored a 4-2 victory over No. 2 Virginia (29-2) in a rematch of last year's final at Stanford, and the Gators (27-1) coasted to a 4-0 win over No. 1 UCLA (26-3). USC and Florida were led Steve Johnson and Allie Will, respectively. Both are ranked No. 1 nationally in singles. Bank of the West Classic -- Jelena Jankovic and Nadia Petrova -- formerly ranked No. 1 and 3 in the world, respectively -- will join defending champion Serena Williams and two-time winner Marion Bartoli in this summer's Bank of the West Classic at Stanford. Jankovic played in the tournament from 2002 through 2006 and in 2009, reaching the quarterfinals three times. The 27-year-old Serb, now ranked No. 21, has won 12 singles titles and one doubles crown on the WTA tour. She gained the final of the U.S. Open in 2008. Petrova, a 29-year-old Russian, will make her fourth appearance in the Bank of the West Classic. She lost in the first round in 2003 and 2008 and the second round in 2009. Petrova, now ranked No. 29, has won 10 singles and 20 doubles crowns on the WTA circuit, and she has reached the singles quarterfinals or better in all four Grand Slam tournaments. Tickets to the Bank of the West Classic, July 9-15 at the Taube Family Tennis Stadium on the Stanford campus, are available at (866) WTA-TIXS or http://www.bankofthewestclassic.com/. Pete Sampras, Jim Courier and Michael Chang -- all International Tennis Hall of Famers from the United States -- will play a series of exhibition matches July 11-13. Admission to qualifying, July 7-8, is free. Clijsters to retire (again) -- Former world No. 1 Kim Clijsters announced she will retire, for the second time, after this year's U.S. Open. The Belgian, who will turn 29 on June 8, has captured the singles title at Flushing Meadows three times. Clijsters has won the Bank of the West Classic four times but hasn't played in the tournament since 2006. She has not entered this year, either. Open de Nice Cote d'Azur in Nice, France -- Qualifier Sam Querrey, a San Francisco native who's scheduled to play five matches for the Capitals, lost to Mikhail Kukushkin of Kazakhstan 6-2, 7-5 in the first round of the clay-court tournament. However, wild cards Querrey and John Isner upset second-seeded Rohan Bopanna of India and David Marrero of Spain 6-3, 6-3 in the first round of doubles. Top-seeded Bob and Mike Bryan, the 1998 NCAA doubles champions from Stanford, eked out a 4-6, 6-2, 10-7 tiebreak win over Daniele Bracciali of Italy and Jamie Murray of Great Britain to reach the semifinals. The Bryans, the 34-year-old twin sons of Capitals coach Wayne Bryan, will face third-seeded Aisam-Ul-Haq Qureshi of Pakistan and Jean-Julien Rojer of the Netherlands Antilles. Qureshi and Rojer defeated Scott Lipsky, an NCAA doubles runner-up in 2002 from Stanford, and Rajeev Ram of Carmel, Ind., 6-3, 6-2. World Team Cup in Dusseldorf, Germany -- Folsom resident Dmitry Tursunov went 1-1 as Russia lost to Serbia 2-1 in the Power Horse World Team Cup on clay in Dusseldorf, Germany. Tursunov lost to Viktor Troicki 6-3, 6-2 and teamed with Igor Kunitsyn to beat Miki Jankovic and Nenad Zimonjic 7-5, 7-6 (6). It was Tursunov's first victory in singles or doubles since he and Zimonjic reached the doubles semifinals at Doha in the first week of the year. Russia, 0-2 in the Blue Group, will finish round-robin play against Croatia. The winners of the Blue Group and the Red Group will meet in Saturday's final. French Open -- Mardy Fish, the top-ranked American man at No. 10 in the world, withdrew from the year's second Grand Slam tournament because of fatigue. Fish, who has played only one match since late March, is still scheduled to play on grass at Queen's Club in London and at Wimbledon before joining the Capitals for home matches on July 12 and July 13. Taiwan's Jimmy Wang, who trains with Tursunov in Granite Bay, lost to Pedro Sousa of Portugal 3-6, 6-4, 6-1 in the first round of French Open qualifying. ITF Women's Circuit in Sumter, S.C. -- Romana Tedjakusuma, an Indonesian living in Tracy, dismissed Nika Kukharchuk of Russia 6-3, 6-2 in the first round of the $10,000 Palmetto Pro Open in Sumter, S.C. In the opening round of doubles, qualifiers Tedjakusuma and Diana Ospina of Bloomfield Hills, Mich., routed American wild cards Madeleine Kobelt and Komal Safdar 6-2, 6-1. Tedjakusuma, 35, is ranked No. 732 in the world. She reached No. 82 at 17 years old in 1994 but left the circuit to attend Nicholls State in Thibodaux, La. 7 a.m.-4 p.m. (live), 4-7 p.m. (French Open Tonight). Through Monday -- NCAA Division I Singles and Doubles Championships, men and women, Athens, Ga., www.georgiadogs.com, www.ncaa.com. Mardy Fish, Sacramento Capitals (2012) of World TeamTennis -- No. 10 in singles (-1), No. 724 in doubles (-268). John Paul Fruttero, Cal All-American in 2001 and 2002 -- No. 92 in doubles (-9), unranked in singles. Mark Knowles, Capitals (2001-07, 2009-12), three-time World TeamTennis Male MVP (2001, 2005 and 2007) -- No. 82 in doubles (-2), unranked in singles. Conor Niland, 2006 Pacific-10 Conference Player of the Year and two-time All-American at Cal -- No. 341 in singles (+2), unranked in doubles. Sam Querrey, San Francisco native, Capitals (2012) -- No. 71 in singles (+18), No. 61 in doubles (-1). Dmitry Tursunov, Folsom resident -- No. 87 in singles (-1), No. 242 in doubles (-17). Jimmy Wang, Folsom resident -- No. 192 in singles (+3), No. 381 in doubles (+2). Pedro Zerbini, All-Pacific-10 Conference first team at Cal (2009-11) -- No. 685 in singles (-2), No. 1,397 in doubles (-6). Raquel Kops-Jones, 2003 NCAA doubles champion from Cal -- No. 24 in doubles (-1), No. 725 in singles (-4). Asia Muhammed, Capitals (2012) -- No. 196 in doubles (+10), No. 469 in singles (+5). Maria Sanchez, Modesto resident -- Career-high No. 146 in doubles (no change), No. 283 in singles (no change). Yasmin Schnack, Elk Grove resident, Capitals (2011-12) -- No. 148 in doubles (-1), No. 394 in singles (no change). Romana Tedjakusuma, Tracy resident -- No. 732 in singles (-5), unranked in doubles. CoCo Vandeweghe, Capitals (2009, 2012) -- No. 156 in singles (-1), No. 291 in doubles (-7). Some friendly advice for Novak Djokovic: Don't get those Grand Slam hopes too high. For Djokovic, who turns 25 today, to have a chance of continuing his quest for the Grand Slam, someone will have to beat Rafael Nadal, arguably the greatest clay-court player ever, in the French Open. The year's second Grand Slam tournament starts Sunday. Nadal reaffirmed his status as the French Open favorite with a 7-5, 6-3 victory over the top-ranked Djokovic on Monday in the final of the Italian Open in Rome. The match was postponed one day by rain. "I don't think I played that well," Nadal, who won a record sixth Italian Open and regained the No. 2 ranking, told reporters. "I can do better. When you are not serving 100 percent perfect, then you are in trouble because he returns hard. I am trying to play more aggressive, and I am hitting the ball better than last year." Since beating Nadal seven straight times, including in last year's Italian Open final, Djokovic has lost twice in a row to his Spanish rival. Djokovic also fell to Nadal in the Monte Carlo final last month while grieving his grandfather's death. "He is always the favorite even if I win against him seven times," Djokovic said. "He is the best player in the world on this surface, and the two (Italian Open titles) I had gave me confidence, and I think that the match today was quite close even if he won in straight sets." Nadal has French Open singles titles to Djokovic's none. But the Serb has won the last three Grand Slam crowns, including an epic victory over Nadal in this year's Australian Open final, and four of the last five. Roger Federer beat Djokovic in the semifinals of last year's French Open before losing to Nadal. What about that Grand Slam quest, Nole (Djokovic's nickname)? "I cannot say that thought is not present. It's there," he conceded. "I am going and preparing for a Grand Slam as I prepare for any other big event, with more focus. It's two weeks long and the most important tournament, and we always want to deliver our best game. I feel good on the court, and I need to make a few adjustments before Paris, but I'll be in top form." World Team Cup in Dusseldorf, Germany -- Christopher Kas and Florian Mayer nipped Igor Kunitsyn and Dmitry Tursunov, a Sacramento-area resident, 6-4, 3-6, 10-8 tiebreak in Germany's 3-0 victory over Russia in the Power Horse World Team Cup. WTA in Brussels -- Australians Casey Dellacqua and Anastasia Rodionova surprised second-seeded Raquel Kops-Jones, a former NCAA doubles champion from Cal, and Abigail Spears of San Diego 7-6 (3), 6-2 in the first round of the Brussels Open. NCAA Championships in Athens, Ga. -- The top-ranked USC men will play for their fourth consecutive NCAA title today against No. 2 Virginia in a rematch of last year's final at Stanford. The Trojans (32-1) defeated UCLA 4-1, and the Cavaliers (28-1) downed Pepperdine by the same score. The No. 2 Florida women (26-1), meanwhile, will try to win their second straight NCAA crown when they face No. 1 UCLA (26-2). They advanced with 4-3 victories over No. 3 Duke and No. 4 USC, respectively. The showdown between top-ranked Novak Djokovic and five-time champion Rafael Nadal in the Italian Open final was postponed by rain and rescheduled for 3 a.m. PDT today. Tennis Channel will televise the match live from Rome and replay it at 9 p.m. If Nadal avenges his loss to Djokovic in last year's Italian Open final, the Spaniard will regain the No. 2 ranking from Roger Federer, according to the ATP World Tour. Federer moved ahead of Nadal last Monday after winning the Mutua Madrid Open. --Chris Guccione, a 6-foot-7 left-hander from Australia who reached No. 67 in the world in 2008. --Devin Britton, who in 2009 at Mississippi became the fourth freshman to win the NCAA singles title. The Mississippi native joined Jimmy Connors of UCLA in 1971, John McEnroe of Stanford in 1978 and Cecil Mamiit of USC.in 1996. --Bjorn Fratangelo, who last year joined McEnroe as the only Americans to win the French Open boys singles title in the Open Era. --Philip Bester, a Canadian who won the Chico Futures title last year. --Fritz Wolmarans, the 2010 Davis Futures champion from South Africa. --Christian Harrison, the 17-year-old brother of rising young American Ryan Harrison. --Former Cal star Pedro Zerbini of Brazil and current Bears standout Nick Andrews of Folsom in the Sacramento area. NCAA Championships in Athens, Ga. -- For the second straight year, the Stanford men lost to Virginia in the quarterfinals of the NCAA Championships. This time, the second-ranked Cavaliers (28-1) breezed to a 4-0 victory over the No. 11 Cardinal (20-9). Stanford was shut out in the NCAA Championships for the first time since falling 4-0 to USC in Tulsa, Okla., in 2004. Virginia, last year's runner-up to USC, captured two of three doubles matches to earn one point. The Cavaliers then won in straight sets at No. 3, 4 and 5 singles to clinch the overall victory. Cavaliers freshman Mitchell Frank, playing No. 3 singles despite being ranked second nationally, routed unranked Matt Kandath, a junior, 6-2, 6-0. Virginia is the only semifinalist from outside the Los Angeles area. In today's matches, the Cavaliers will face seventh-ranked Pepperdine, and top-ranked USC, the three-time defending champion, will meet UCLA. The Waves upset No. 3 Georgia, the host school. Los Angeles has two of the four women's semifinalists. Also today, No. 1 UCLA will play No. 4 USC, and No. 2 Florida, the defending champion, will take on No. 3 Duke. 1. No. 5 Courtney/Jenkins (UVA) d. Lin/Thacher (STAN) 9-8 (2). 2. Klahn/Morrissey (STAN) d. Alex Domijan/Mitchell Frank (UVA) 8-5. 3. Shane/Uriguen (UVA) d. Ball/Kandath (STAN) 8-4. 1. No. 36 Bradley Klahn (STAN) vs. No. 4 Jarmere Jenkins (UVA) abandoned. 2. No. 29 Ryan Thacher (STAN) vs. No. 39 Alex Domijan (UVA) abandoned. 3. No. 2 Mitchell Frank (UVA) def. Matt Kandath (STAN) 6-2, 6-0. 4. Drew Courtney (UVA) def. John Morrissey (STAN) 6-2, 6-4. 5. No. 82 Justin Shane (UVA) def. Daniel Ho (STAN) 6-4, 6-1. 6. Robert Stineman (STAN) vs. Julen Uriguen (UVA) abandoned. One classic matchup down, one to go. Top-ranked Novak Djokovic beat third-seeded Roger Federer 6-2, 7-6 (4) Saturday to set up a showdown with Rafael Nadal in the final of the Italian Open on clay in Rome. Djokovic met Federer for the first time since saving two match points in a five-set victory in the semifinals of last year's U.S. Open. Djokovic, who will turn 25 on Tuesday, trails the 30-year-old Federer 14-11 in their head-to-head series but has won five of the last six matches. Federer has never won the Italian Open, falling in the final to Felix Mantilla of Spain in 2003 and Nadal in 2006 (7-6 in the fifth set). For the eighth straight year, either Djokovic or Nadal will win the tournament. They will meet today in a match televised live by Tennis Channel at 7 a.m. PDT and repeated at 11:30 a.m., 4 p.m. and 8:30 p.m.
Nadal has won the title five times and Djokovic twice. Today's encounter will be a rematch of last year's final, which Djokovic won 6-4, 6-4. Nadal, 25, leads the overall series 17-14 (10-2 on clay) and is 1-1 against Djokovic this year. Djokovic prevailed 5-7, 6-4, 6-2, 6-7 (5), 7-5 in 5 hours, 53 minutes in the Australian Open final, the longest Grand Slam title match in history. Nadal then ended a seven-match losing streak to Djokovic with a 6-3, 6-1 victory last month for his eighth straight Monte Carlo title, but the Serb was grieving his grandfather's death at the time. NCAA Championships in Athens, Ga. -- It's bad enough that both remaining Northern California women's teams were knocked out of the NCAA Championships on Saturday. Worse yet, they lost to Pacific-12 Conference rivals from Southern California. No. 4 USC eliminated No. 5 Stanford 4-2, and No. 1 UCLA ousted No. 9 Cal 4-1. For the first time in three years, the Cardinal (21-2) won't play in the final. Stanford won the 2010 title in Athens and lost to Florida last year at Stanford. The top four teams in the rankings will meet in Monday's semifinals. The Bruins (25-2) will face the Women of Troy (24-3), and No. 2 Florida (25-1) will take on third-ranked Duke (28-2). With Stanford and USC tied 2-2, the Women of Troy survived three-set battles at No. 2 and No. 3 singles to clinch the overall victory. Danielle Lao, ranked 19th, outlasted No. 5 Mallory Burdette 4-6, 6-2, 6-4 at the second position, then No. 26 Sabrina Santamaria edged No. 25 Stacey Tan, last year's NCAA runner-up, 7-5, 1-6, 7-6 (5). Cal's point came from Zsofi Susanyi at No. 2 singles. Susanyi, ranked 13th, routed McCall Jones, ranked 98th, 6-2, 6-1, but the Bears ended their season at 20-7. 1. No. 3 Christian/Santamaria (USC) d. No. 2 Burdette/Gibbs (STAN) 8-6. 2. No. 24 Tan/Tsay (STAN) d. No. 49 Pulido/Scandalis (USC) 8-5. 3. No. 75 Lao/Ramos (USC) d. Ahn/Li (STAN) 8-6. 1. No. 3 Nicole Gibbs (STAN) d. No. 14 Zoe Scandalis (USC) 6-1, 6-4. 2. No. 19 Danielle Lao (USC) d. No. 5 Mallory Burdette (STAN) 4-6, 6-2, 6-4. 3. No. 26 Sabrina Santamaria (USC) d. No. 25 Stacey Tan (STAN) 7-5, 1-6, 7-6 (5). 4. Kristie Ahn (STAN) vs. No. 89 Kaitlyn Christian (USC) abandoned. 5. Gabriella DeSimone (USC) d. No. 74 Ellen Tsay (STAN) 1-6, 6-2, 6-2. 6. Veronica Li (STAN) d. Valeria Pulido (USC) 6-4, 7-5. 1. No. 4 Robin Anderson (UCLA) vs. No. 8 Jana Juricova (CAL) 4-6, 2-5 DNF. 2. No. 13 Zsofi Susanyi (CAL) def. No. 98 McCall Jones (UCLA) 6-2, 6-1. 3. No. 73 Pamela Montez (UCLA) def. No. 30 Anett Schutting (CAL) 6-3, 6-4. 4. No. 124 Skylar Morton (UCLA) def. No. 48 Tayler Davis (CAL) 6-1, 6-4. 5. No. 119 Chanelle Van Nguyen (UCLA) vs. No. 67 Annie Goransson (CAL) 6-1, 5-2 DNF. 6. Carling Seguso (UCLA) def. Alice Duranteau (CAL) 6-2, 6-4. Today -- Rome (women), final, Li Na vs. Maria Sharapova, Tennis Channel, 4:30-7 a.m. (live), 9:30-11:30 a.m. (repeat), 2-4 p.m. (repeat), 6:30-8:30 p.m. (repeat). Rome (men), final, Novak Djokovic vs. Rafael Nadal, Tennis Channel, 7-9:30 a.m. (live), 11:30 a.m.-2 p.m. (repeat), 4-6:30 p.m. (repeat), 8:30-11 p.m. (repeat). Today -- NCAA Division I Team Championships, men's quarterfinals, Athens, Ga. No. 11 Stanford vs. No. 2 Virginia, 2 p.m. (PDT). Monday -- NCAA Division I Team Championships, men's and women's semifinals, Athens, Ga.
Tuesday -- NCAA Division I Team Championships, men's and women's finals, Athens, Ga.
Wednesday-May 28 -- NCAA Division I Singles and Doubles Championships, men and women, Athens, Ga.
May 27-June 3 -- $50,000 FSP Gold River Women's Challenger, Gold River Racquet Club, 2201 Gold Rush Drive, Gold River. MAY 27-JUNE 10 -- FRENCH OPEN. June 2-10 -- $15,000 Sacramento Men's Futures, Park Terrace Swim & Tennis Club, 5500 Parkfield Court, Sacramento. June 9-10, 16-18 -- NorCal 18 Junior Sectional Championships, Sacramento State. JUNE 25-JULY 8 -- WIMBLEDON. July 7-15 -- WTA, Bank of the West Classic, Stanford. July 9 -- World TeamTennis, Sacramento Capitals' season opener at Boston, 4 p.m.
July 12 -- World TeamTennis, Capitals' home opener (with Mardy Fish) vs. Kansas City, Sunrise Marketplace Stadium, Sunrise Mall in Citrus Heights, 7:35 p.m.